The Maiden Tower is one of the most dominant architectural pieces, due to its vague design and the stories that surround it. 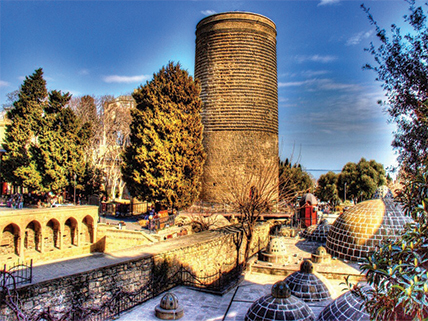 Said to be built in the 12th century originally on the shore of Caspian Sea (later due to land reclamation, the tower is no more near the Caspian Sea), it was supposed to serve as a watch tower. But the construction and architecture, points the needle to nearly 2,500 years back. It's an important part of Azerbaijani history considering that it features on the country's currency notes and other documents.